This year has been, like all years, full and fascinating and up and down and joyful and painful. It’s been a year of growth and of change, and it’s also been a year to be thankful for the consistency of certain aspects of life. Today, I wanted to share with you a few thoughts on what I’ve learned this year. The last three lessons are ones that I shared last year, too; when I re-read them, I thought, “Those are worth repeating.” So I did. I hope you enjoy this post, and I hope it inspires you to reflect on what you’ve learned this year as well! 1. I LOVE listening to podcasts and being interviewed on them. This year, I was interviewed on close to 30 different podcasts, and I probably listened to over 200 hours of podcasts: shows on Tolkien, on Lewis, interview shows, shows about history or religion or parenting, etc. I found this year that I can learn a ton on my commute to and from school (a 90-minute round trip each day) by podcasting, and I strongly recommend you find some that you enjoy as well. The Jordan Harbinger Show is great for interviews and motivation, and the Prancing Pony Podcast and The Green Door Podcast are two of my favorite Tolkien-based shows. 2. I am supremely blessed in that every single day I go to work, I also get to do what I love. Whether I’m teaching a high school history or Bible class, coaching soccer (youth or high school), or doing a presentation on blended family life, leadership, or education; whichever ‘job’ I’m working that day is a job that I love. I consider myself to be among the most blessed people in the world because I get paid to do what I would volunteer to do anyway. And I never want to take that for granted. 3. Temptations to make selfish decisions never fully go away. 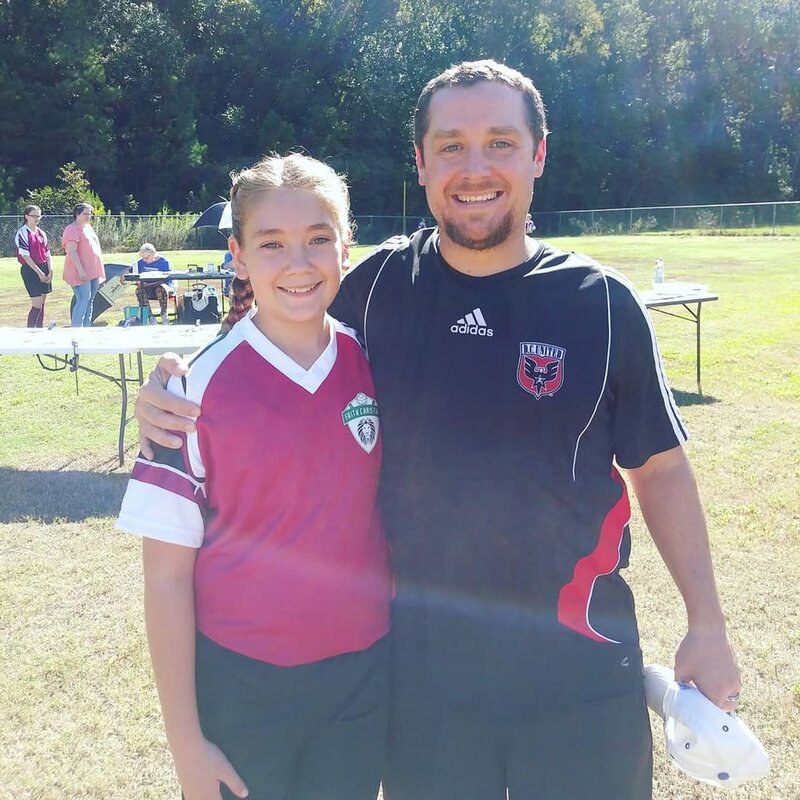 Coaching my younger daughter’s church league soccer team for the final year was bittersweet. One of my biggest failures in the past has been spending too much time on sports and not enough time with my family. As I got older, I thought this would get easier; turns out, I was wrong. What I’ve learned this year is that every single day I have to re-choose to make the right decisions. It’s a never-ending battle in which I have to die to self and choose others. Sometimes I fail; many times, by the grace of God, I succeed. But I am more than ever convinced of the truth spoken by John Bradford centuries ago, when it comes to temptation or to sin: “There, but for the grace of God, go I.” I’m not any better than anyone else; only by God’s grace can I do anything good. It’s humbling, because it’s true. 4. 14 and 11 is harder (and easier) than 13 and 10. This year, my older daughter turned 14, and it was both easier and harder than 13. It was harder because her friends are turning 15, dating more, getting driver’s permits, and transitioning more to adulthood, and she is on the same path. But it was also easier because she’s maturing, she’s making good decisions, and she’s showing that she has the makings of an amazing young woman. I wouldn’t go back to 13 (though it wasn’t bad! ), but I’m also not rushing to get her to 15. My younger daughter is now 11 and almost done with elementary school. The thought that my younger one is about to enter middle school is hard, because kids get meaner and problems get bigger. But I’m also excited about the young lady she is becoming, and I’m thankful to get to see her continue to grow and develop and learn, especially as she often imitates her older sister. 5. Dogs don’t understand time changes. I was very excited about the “fall back” time change, when we gain an extra hour of sleep. My dogs, not so much. Turns out dogs don’t know that the clock says a different time; and that time means that I should get to sleep in a bit! Nope, they’re hungry, or they have to pee, and so at 4:45 (which would have been 5:45), they’re awake and ready for the day to begin. I was not thrilled. We got it sorted after a week or so, but yeesh, I should have seen that coming and prepared. 6. My best friend got married, and I’m so thrilled for him and his wife! I was absolutely honored and thrilled to get to be part of my best friend’s wedding this year. He’s been looking forward to marriage and settling down for some time, and I couldn’t be happier for him and his bride. When we get together, we now laugh about the amusing parts of marriage, and we still recount tales of idiotic things we did when we were younger. The change is subtle but unmistakable: he seems happier, more settled, and it makes me smile each time I think about it. When I gave a toast at his wedding reception, I forgot to say one important thing, and so I’ll say it here: we’ve been buddies for 30+ years, and I couldn’t have asked for a better, more loyal friend. Through ups and downs, moves and changes, pain and joy, he’s been there; and now, we’re thrilled to have his wife as part of our family as well. 7. Reading is a key part of my world. Listening to audiobooks and podcasts is great, but I also found this year that when I don’t take time to actually sit and read a book (an actual book, with pages and everything; nothing against e-readers, but I just don’t enjoy them as much), I get a bit cranky. So this year, despite the busy, I carved out a bit of time to read at least a few nights each week. And I’m glad I did. 8. Learning history is more important now than ever before. I’m sure this sounds self-serving since I’m a history teacher, but I believe it is true regardless. Look at the news, follow any major storylines, and you’ll see that people of all political persuasions are taking more liberties with ‘truth’ than ever before. As a result, we need to arm ourselves against those influences by being knowledgeable about the past. And the only way to do that is through learning it. The danger here is that ALL HISTORY that you learn is biased in some way. All of it. Some person wrote it, and therefore the history is influenced by the person who wrote it. We need to remember that is also true of every news article we read, whether about something as huge as politics and tax cuts or something as mundane as a basketball game. The key is: go learn your history, and then you will be better able to see through the biased ‘truth’ being presented by both sides, and you will thus be better able to make an informed judgment about what the truth really is. Start with something simple: sign up for the “This Day In History” email from the History Channel website, and then just read the major headlines each day. You’ll be amazed at how much you’ll learn in a few minutes. 9. Looking to serve other people builds better relationships than just looking to profit from them. I have always believed in the value of building good relationships, and I learned this year that it’s even more important than I’d realized. Again, I came across this by listening to various podcasts in which Bob Burg (best-selling author of ‘The Go-Giver’ and other books, www.burg.com) emphasized how important it is that we serve other people even when it isn’t going to get us more business or help us make better profits. Also, at the recommendation of my best friend, I read a couple of great books by Andy Andrews (The Noticer and The Noticer Returns ) that emphasize similar ideas. Simply by looking to serve first we build better relationships. In the long run, these may help us profit more, but the point is: profit ISN’T the point. Relationships are. My wife and I enjoying a date in Orlando after I spoke at a conference there. It’s hard not to be hopeful when surrounded by beauty. This year, like all years, I’ve spent much time reading through the works of Tolkien and C.S. Lewis, and I also began reading works by a man that influenced both of them: G.K. Chesterton. Throughout all of their works, there is a common theme: hope. No matter how bad things are (or seem to be), where there’s life, there’s hope, as Tolkien says. 2018 seemed to be awful for a lot of people in a lot of ways, and unfortunately that means many people are anticipating 2019 to be even worse. Fortunately, this doesn’t have to be so. Let’s commit to making our little pocket of the world a better place, full of hope and joy, and together we can make 2019 better than any of us expect! If you don't believe me, that's ok; do me a favor and go read anything by Tolkien (especially 'The Hobbit' or 'The Lord of the Rings') or Lewis (especially 'The Chronicles of Narnia' or 'Mere Christianity') and just enjoy them. You'll also be amazed at how hopeful you feel while reading them. For a number of years now, I have been reminded of one important truth: we can all be redeemed, none of us is without hope of improvement. I believe that the Bible is true, and it teaches us that all of us are broken sinners; but it also teaches us that we have a hope in Jesus Christ. It teaches us that He will never leave us or forsake us, and it teaches us that through Him, no matter who we are or what we’ve done, His grace is sufficient for us. Therefore, there is ALWAYS hope. Let’s look forward to a hope-filled 2019! Today, write down five lessons you learned in 2018, and how you hope to apply those lessons in 2019. This past Sunday we had the rare experience of living in our home without power for almost a whole day. That morning someone in our neighborhood ran into and knocked down a power pole, so our whole area was without electricity from before noon until almost 9pm. During that time, we had some fun and I was reminded of three important lessons that I wanted to share with you. 1) It’s GOOD to unplug for a while. I know we all know this, but sometimes we need to be reminded of just how beneficial it is for us to disconnect from all of our electronics for a while. It’s good for us not just for its own sake but also for the opportunities it presents. For my wife and I, instead of watching soccer online (me) or doing some work for her job (my wife), we decided to go and play a dice game on our back patio, a game we got at her family’s reunion. We had a great time, enjoyed the fresh air and cooler temperatures, and were able to reconnect in a way that we wouldn’t have done if we’d been in front of our various screens. 2) It’s an opportunity for patience and understanding. Even though the power was out, life still had to happen, so that meant we needed to do things differently; and in our power-free world that evening, it also meant doing things more slowly. My daughter had lots of make-up homework to do, so we got her set up at the kitchen table doing work by a combination of candlelight and flashlight. For me, instead of typing or doing video work, I simply read a book on leadership that I hadn’t made much time for lately. It was an excellent chance for both of us to see that we can still get our tasks accomplished, even if we had to do them differently than we might have otherwise. 3) It’s an opportunity for creativity and family time. Again, with electronics off the table, we had a chance to do many other things: while my older daughter and I were catching up on missed work, my younger daughter spent even more time than usual reading. In addition to that, she and my wife spent extra time working on their performance for an upcoming talent show, and then my wife spent more time playing her ukulele. All in all, we had a wonderful time being in the same place, interacting in ways we wouldn’t have done if we’d had power. There are three quick things I learned from our power outage, and they’ve inspired me to do a better job of turning off our screens even if the power is still on. I hope they encourage you along the same lines. There is something powerful and inspiring to me about working and living by candlelight, even if it’s only every once in a while; perhaps it’s the same with you. Action Plan: This week, consciously plan out time to turn off the electronics and spend more time interacting and being creative with the people in your world. You’ll all be thankful you did.